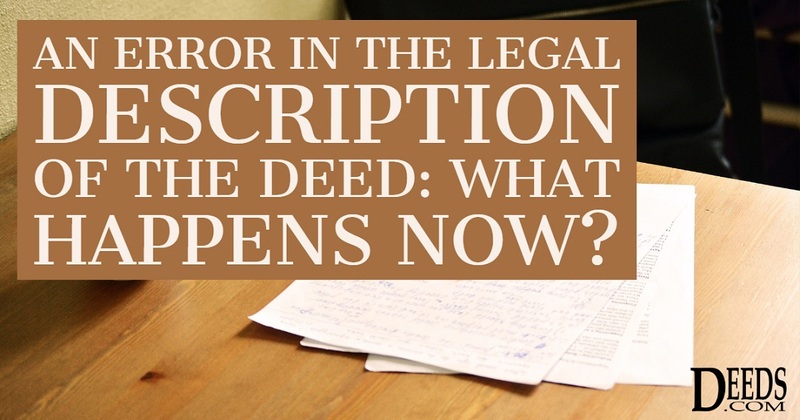 An Error in the Legal Description of the Deed: What Happens Now? What can the buyer do when a real estate deed carries an incorrect legal description of the property? Perhaps it describes the wrong parcel, or fails to reflect all land purchased in the sale. An error in a legal description of a property has consequences. It can affect taxes. As lenders extend loans based on a percentage of the property’s appraised value, footage mistakes can sink a loan approval. If the error is neglected, disputes can arise later, and they can become the stuff of nightmares. Some deeds bear legal descriptions drafted using early survey methods, pre-dating GPS measurements. Some have errors in lot descriptions that get passed unwittingly from one owner to the next—a sort of legal time bomb waiting to take someone by surprise. In Texas, a correction deed is the deed issued to make changes to an erroneous deed. These two instruments are closely linked, and all corrections are effective as of the date of the original recorded instrument (Property Code Sec. 5.030). Errors in a deed may create uncertainty about the title and cause problems when the current owner tries to transfer the property at a later point. Executing and recording a correction document is an easy way to prevent this. By recording a new document.